Two days ago I wrote about how Davey Wreden’s relationship with his friend as it was portrayed in The Beginner’s Guide had a substantial impact on how I viewed one of my own friendships. That revelation certainly tore me apart when I first played the game, but recently a different interpretation of Wreden’s soulful monologue simulator became even more disturbingly relatable. Wreden’s mournful concern at his own desperate need for validation in his artistic endeavors resonated with me as a writer, particularly during this grueling writing challenge in which I have chosen to participate. Let’s start with what I mean by “different interpretation.” The story of The Beginner’s Guide has essentially two major broad interpretations. The first is the one that originally destroyed me emotionally: the literal assumption that Wreden’s friend Coda was a real person that he let down due to his own unfortunate social tendencies. This is a perfectly legitimate interpretation, and was obviously the first one that came to mind when I played the game back in 2015. After further reflection, the second potential meaning behind Wreden’s words sends a much more fundamental message. The idea is that Coda is not literally another person that Wreden interacts with, but instead a part of his own psyche that is at odds with his conscious mind. Put more simply, Wreden IS Coda. Coda is a representation of Wreden’s subconscious artistic mind that acts without the need for praise or validation. This interpretation casts The Beginner’s Guide in a very different light. It is no longer a heartbreaking character study of two very different game developers and is instead a story about a man torn in two, shouting into the void about how much it hurts. One side of Wreden, the side that he names “Coda,” is an artist at heart. He doesn’t need external motivation to create what he wants, he just needs the inspiration that dwells inside him. Wreden’s main personality is exactly the opposite: he thrives on the acknowledgement of his talents that others provide him. These two aspects of Wreden’s being are naturally at odds with one another, leading to the conflict presented in Wreden’s game. Coda creates games and shows them to Wreden, but immediately recoils once they are shown to the public. The artist for the art’s sake cannot handle the needs of the human being in control. What’s interesting is how Wreden’s decisions regarding his artistic subconscious seem extremely logical. He sees that Coda is struggling to create, that his art is becoming self-destructive, and chooses to seek external assistance for these problems. It seems like the correct and mentally healthy choice to make, but instead it suppresses his artistic motivation and makes him doubt what his art actually means to him. The logical “best decision” cannot be applied to artistic motivation, something that is fundamentally illogical. So Wreden is left confused and depressed, despite his obvious talent and success. As a writer on this website (and a songwriter on top of that), this struggle is all too familiar. Without a doubt, I thrive on the praise of others. I feel like my work is legitimized when others see or hear it and tell me that it’s good. When I receive that external validation, I feel like the pain and struggle that it took to produce my work wasn’t wasted. Like my life has a purpose. But deep down inside, some part of me resents those feelings. It considers my desperate search for approval pathetic, something that a true artist wouldn’t need. All I should need is the sublime joy of creation, the incredible feeling that I get when I have completed something that I consider to be good. That feeling exists, without a doubt, but I cannot subsist on it alone. I need feedback from other people to make it all feel real. 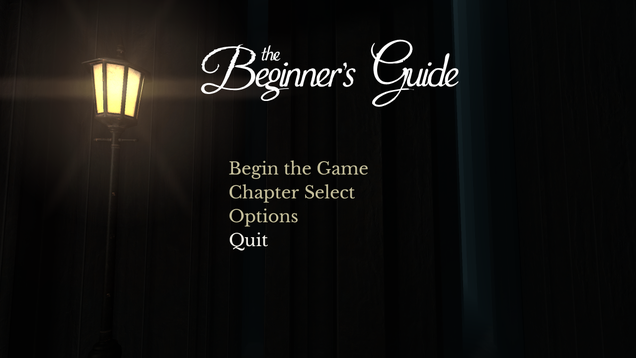 That is why The Beginner’s Guide has been at the forefront of my mind for the past month. In the middle of what is proving to be an extremely difficult endeavor, producing a piece of content every day for two months, some of my more unfortunate artistic and social tendencies have become much more apparent. When I write, I constantly consider how each sentence will be perceived by my audience. I obviously focus on how best to illustrate my points, but at the back of my mind I am always thinking about the possible reactions of the people who will read my work. After the work is done and it is posted for the world (or, more accurately and less grandiosely, the readers of TAY and occasionally Kotaku) to see, I obsessively check for comments to discern how my peers feel about my writing. Logically, and in moderation, this is healthy. After all, how are we meant to improve without some indication as to the quality of our work? That’s not how I feel about it though, regardless of what I think. I look at myself from behind my eyes and pity the behavior that I witness. What kind of pathetic person craves the validation of others so consistently? What kind of creative independence is that? These are the questions that I feel are at the core of The Beginner’s Guide. Regardless of how reasonable Wreden’s behavior is, the emotional and creative side of him rebels against his perceived social dependence. That’s what I find so relatable and haunting about this game three years after its release. The struggle of an artist can be as painful as it is inevitable. Once again, I have detailed a philosophical quandary without providing my own answer. I don’t know to what degree a desire for artistic validation is healthy, and at what point it becomes excessive. I can only continue to write, and attempt to balance my desire to create for creation’s sake with my need for social acceptance. Perhaps that was what Wreden was advocating for all along. Don’t fight any of your artistic desires, simply ensure that you don’t prioritize any one of them over the others. Regardless of what his message was, his words will be sticking with me for a very long time.